I rented a drop trap from Tree House Humane Society for the first time. This is what it looks like set up in my garage. You set the food under the trap, wait for the cat to go under, and then pull the string attached to the stick so that it drops to the ground. 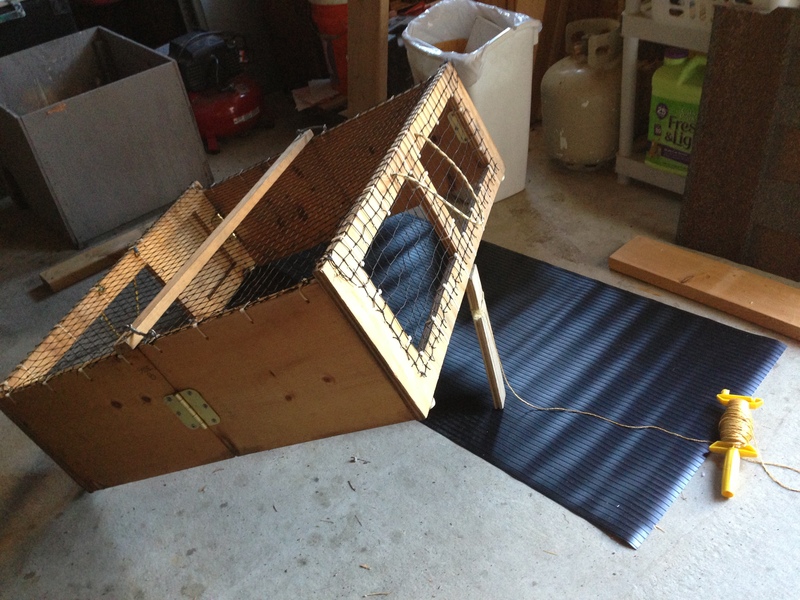 Then you cover the drop trap, and align the door for a Tru-Catch Trap with the wooden drop trap door (you can see it in the back on the opposite end), and wait for the cat to go into the Tru-Catch trap. I want to use the drop trap to catch a sick cat from the V Colony. I went there the other day to check on the colony and it looked like she was sleeping peacefully in a crate. However, once she woke up and walked away from me, I could see something was wrong. 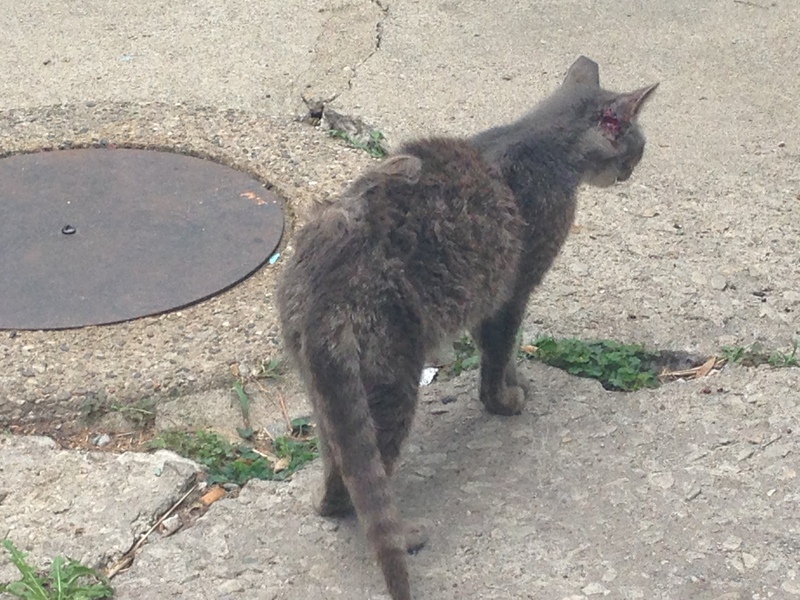 Her hair is disheveled, she has a big wound behind one ear, and she clearly has a URI – upper respiratory infection, as you can hear her congested breathing. She has already been TNR’d, as were 21 other cats from that colony. 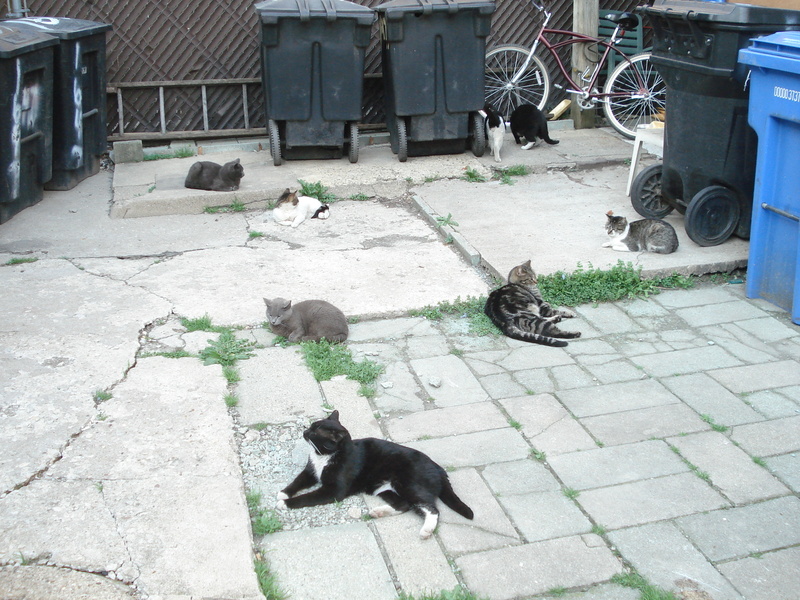 It’s not an easy feat to catch one cat that you have in mind, since they all lounge together. 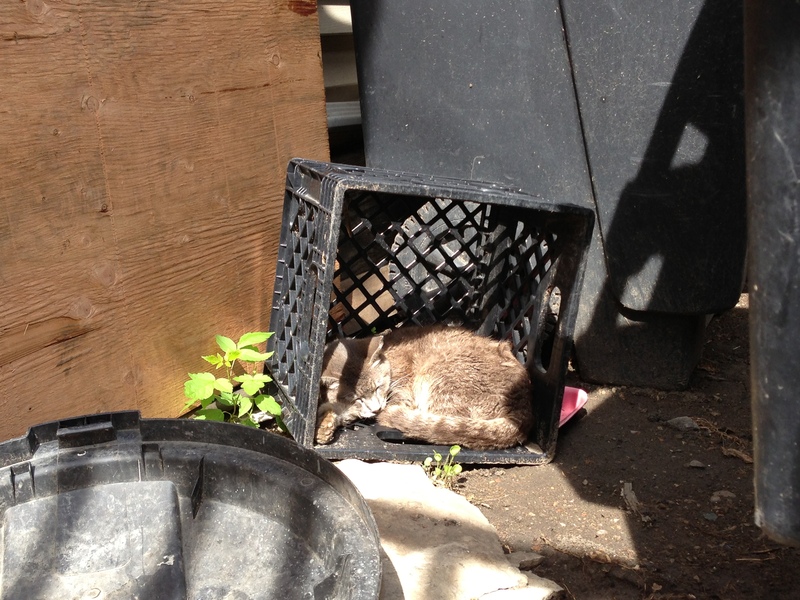 So far we have tried to trap her again using a Tru-Catch humane trap, but she won’t go in. I keep trapping the other cats instead. Since she is used to the feeders they have tried trapping her as well in a trap and carriers, but that also hasn’t worked. I’m hoping the drop trap will do the trick, as I would like to get her medical care, and prevent the other cats from getting sick as well. Wish me luck! Are you able to trap him now? We still have not been successful but we are working on a new plan. I will update as soon as we have any news.